Another month, another great performance. 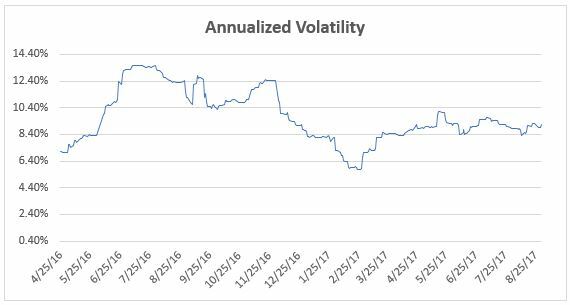 My strategy produced a 3.0% return in November and again volatility remains exceptionally low. 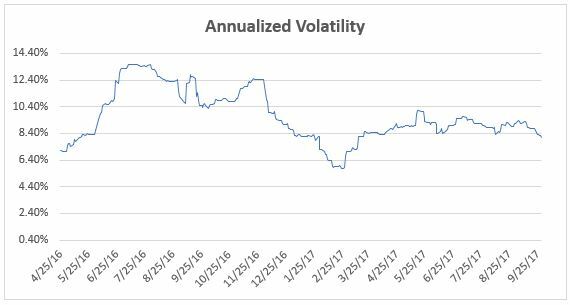 Nobody knows how long this regime of low volatility will remain but strong gains with minimal draw down can make investors very comfortable if not overconfident and we must be aware that higher volatility will return some day and monthly losses will be more prevalent than they have been for the past two years. 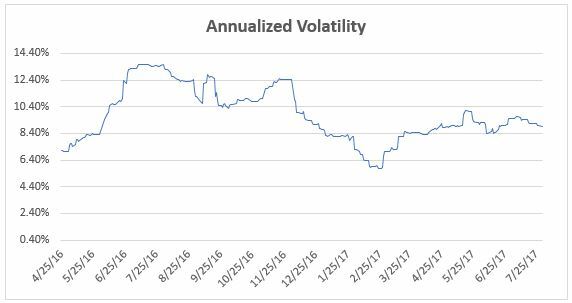 The low volatility combined with consistently positive monthly returns has resulted in a Gain To Pain ratio of 4.52 which is beyond exceptional and which I expect to be lower in the future. You never know what path your monthly returns will follow. My strategy has now provided 13 months of returns without a loss. I couldn’t have predicted that. Yes it feels good but one must never confuse a bull market with brains. 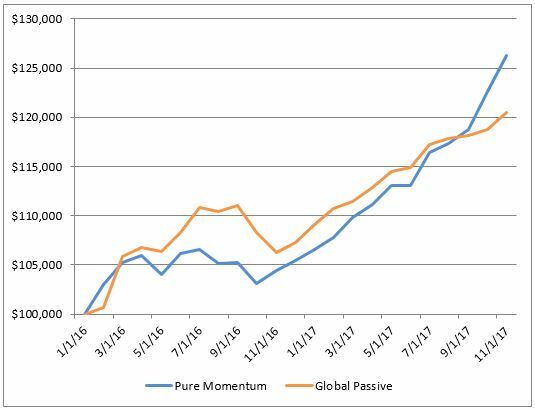 As per the chart below, anyone following a global passive ETF strategy has done almost as well as my strategy. The true test will come when the markets become bearish and every investor’s willingness to stick to their strategy (if they even have one) is tested. My holdings remain unchanged from November to December with my largest holding being EPP (iShares MSCI Pacific ex-Japan). I track the performance of my ETF strategy on Collective2. I think of Van Tharp’s marble game when it comes to monthly performance of an investing strategy. Green marbles represent positive monthly returns and red marbles represent negative monthly returns. Your strategy has an influence on the number of each colour of marbles in a bag. Each month you put your hand in the bag, pull out a marble and look at it to see if your strategy provided a positive or negative return. In that frame of reference I have just pulled out the twelfth consecutive green marble as my strategy provided a 3.23% return in October garnering a 16.2% return year-to-date. 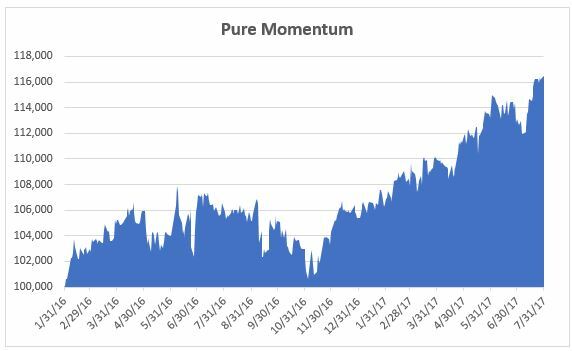 Suffice it to say that I am very pleased with such consistent returns but that is what the combination of my strategy and the markets have provided. At some point, the markets will not be so kind and I will experience a draw down. 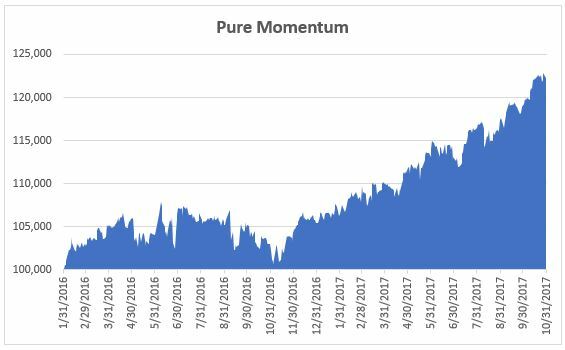 Provided that the markets do not drop precipitously in a very rapid pace, my ETF momentum strategy should provide downside protection. Such is a key benefit of a tactical asset allocation investing strategy. My largest holding for November is EPP (iShares MSCI Pacific ex-Japan). 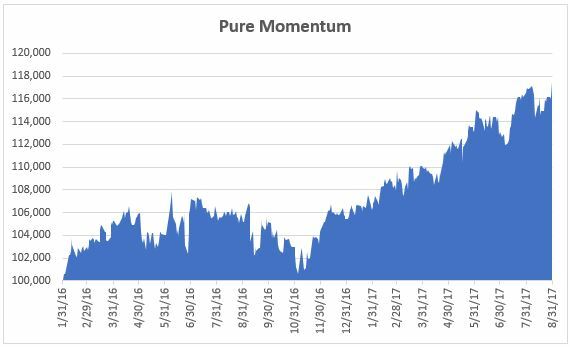 For eleven consecutive months my ETF momentum strategy has posted gains giving it an eye-popping Gain to Pain Ratio of 3.34. My strategy gained 1.25% in September giving it a year-to-date return of 12.6%. The largest holding for October is EWJ (iShares Japan). 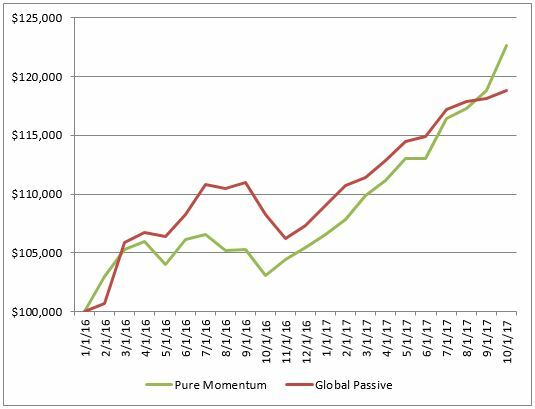 I do track my strategy against a global passive ETF strategy and for the first time my strategy has outperformed the global one on the basis of total return. Total return is only one performance measure. 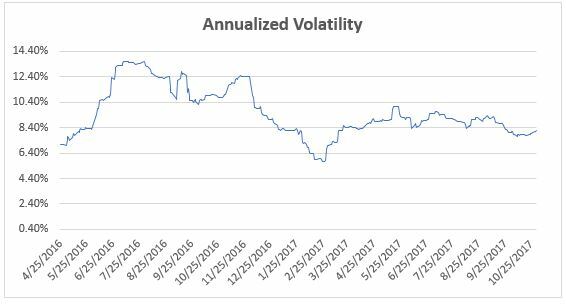 My strategy has a lower volatility of monthly returns (1.39% vs 1.58%) and a higher Gain to Pain Ratio (3.34 vs 3.23) compared to the global passive ETF strategy. 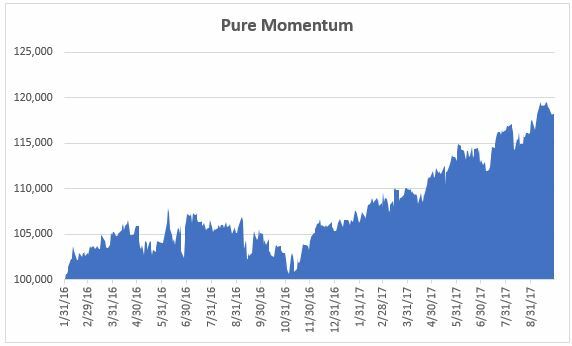 Keep in mind that momentum strategies rarely outperform in a bull market. They are designed to minimize draw down in a bear market and thus end up further ahead than a passive strategy in the long run. First off, I notice my email subscriber list is growing. Given my hectic business schedule during the construction season there is little that I can offer at this time of year other than to report my investment performance. I started doing this years ago to put pressure on myself to improve as an investor. Putting your monthly returns online for all to see is usually humbling but it can lead to a focused effort to improve. Please feel free to send me a note to let me know if there is something you want me to discuss on this site that you haven’t found elsewhere. 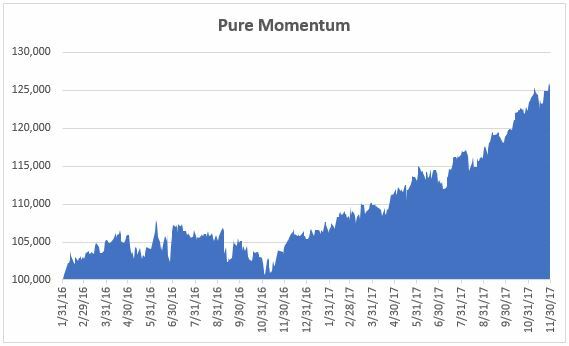 This is the tenth consecutive month that my ETF strategy has posted a positive return. For the month of August, my strategy returned 0.82% as reported by Collective2.com. The largest holdings remain the same in September as they were in August with the largest allocation to Asian equity ETF’s. Tactical asset allocation (TAA) investing strategies such as mine tend not to outperform during bull markets. 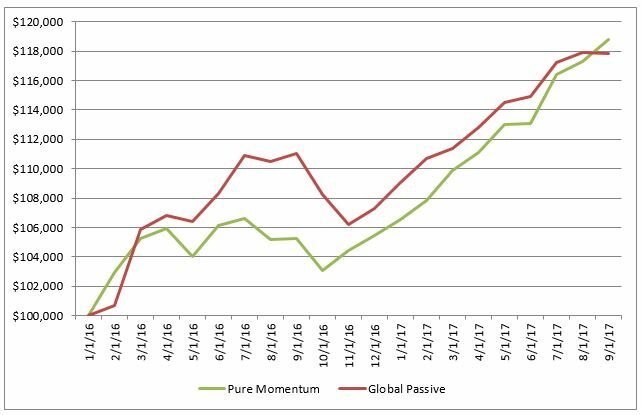 Anyone invested in a truly global ETF passive strategy has enjoyed similar returns to my strategy. During bear markets, TAA strategies perform well as they are designed to move to treasury ETF’s or cash. This inherent design feature results in lower draw downs than any other strategy that has a similar long term return and only trades once per month. My Gain to Pain Ratio of 3.11 is exceptionally high but it is measured over a period of less than three years so it really doesn’t count. By all accounts, my ETF strategy continues to be successful and performed well in July posting a 2.94% gain while maintaining an acceptable level of volatility. The system has now produced nine consecutive months of positive gains and has a CAGR of 10.7%. To be honest, a broadly diversified global basket of low-cost ETF’s has performed similarly so far this year. My system is designed to produce the greatest level of outperformance in bear markets as it will move to cash or likely Treasury ETF’s.